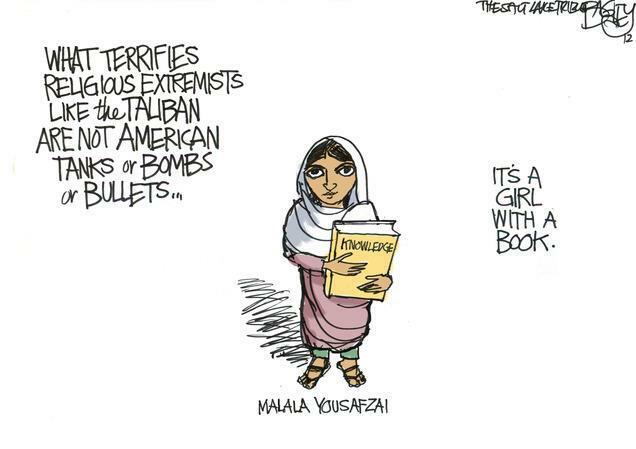 I am sure all of you readers have heard about Malala Yousufzai, a 14-year old girl from the Swat Valley in Pakistan. She was a activist on behalf of girls’ education in a part of the world infested with hateful religious obscuratinists militantly opposed to that sort of thing. She was recently shot in the head by a member of the Taliban for what she was, and that’s something deeply sickening (though not, I submit, terribly surprising to those of us with much historical consciousness about the ways religion deals with dissenters). “You don’t have a bullet go through your brain and have a full recovery,” said Dr. Jonathan Fellus, chief scientific officer at the New Jersey-based International Brain Research Foundation. So apparently knowledge of what we might be but cannot be and what it is really like to have capacities we lack are source of suffering. So there is a kind of knowledge — and not a trivial kind of knowledge, either — that seems to be bad for us. There is something important and intimate we might be better off being less informed about. Small wonder that aging, which is largely the loss of capacities the experience of having which we can access through memory is such a miserable process. And how grim that this ugly fact about (one kind of) knowledge should poke through the story of a heroine who has suffered precisely for the sake of allowing knowledge to spread. October 18, 2012 Iago Faustus, Ph.D.